From the number of emails and texts Lauren and I exchanged in December and January, you’d think we were planning a high-level military operation. Disappointingly for the NSA and all bored government agencies that I’m sure are having a field day poking into a freelance food writer’s correspondence, our flurry of activity was focused on nothing more than a weekend of eating and drinking at Atlanta’s finest watering holes (with a few crazy cat lady selfies thrown in for good measure). OK, OK, we inadvertently got a little culture under our belt when we stumbled upon So You Think You Can Dance auditions during a Saturday afternoon at Red Brick Brewing, Georgia’s oldest craft brewery. 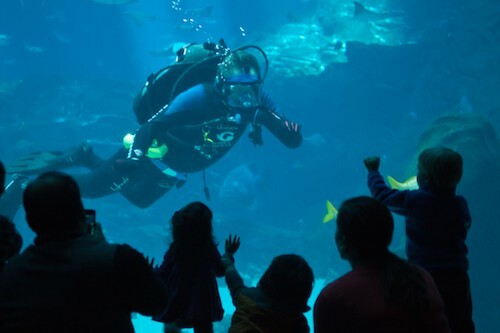 And we reaffirmed our love of adorable otters and beluga whales, fear of creepy gape-mouthed eels, and awe of massive manta rays and translucent jellyfish while gawking at the Technicolor wonders of the Georgia Aquarium. But really, we were there for the food. And while we got our share of boiled peanuts, pimiento dip, and fried green tomatoes during the trip, we started the weekend off with a modern fish fry from chef Ford Fry at The Optimist. Like the ever-shifting tides, The Optimist’s menu changes depending on the fresh seafood available that day—so if you go expecting the snapper dish that someone described to you in rapturous detail, it may not be available this time around. 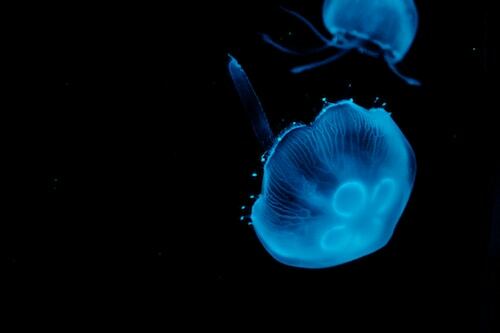 (Don’t worry, denizens of the Georgia Aquarium: you’re not on the supplier’s route.) Unlike Fry’s restaurant JCT. Kitchen just down the street in the Westside Urban Market, which keeps Southern cooking at the core of its menu, The Optimist doesn’t feel constrained by geography. Sure, there are standards like peel-and-eat shrimp and she-crab soup on the menu, not to mention the same fried oysters that made me swoon at JCT. And in a marvelous ode to Southern fare, our server was absolutely correct: the hushpuppy beignets will change your life. Bite-sized rounds of fried dough dusted with powdered sugar disappeared so quickly from our table that we had to order a second round before the appetizers even arrived. However, there’s also charred yet tender octopus with pimenton-spiked fingerling potatoes and marrow aioli for the modernists. A bowl of bok choy comes in a sweet, gingery glaze with pops of pickled pepper. And the globe-spanning accompaniments to all the main courses—lime butter, fennel, and pickled jalapeño with one fish; escarole, calabrese pepper, and preserved lemon with another—made executive decisions even more difficult. I settled on the scallop dish with “glazed pork, celery root, medjool date, marcona almond” listed as its pairings. Though it looked like a jumble of beige and burgundy on the plate (it’s comforting to know that even high-level chefs can’t make brown food look as showstopping as it tastes), the combination hit all the right notes. Earthy, sweet, salty, crunchy, and creamy, each forkful made a strong case for letting go of your OCD tendencies and eating each component in concert. It’s doubtful that there was a wrong choice to make among the litany of menu options, but the scallops and their Mad Lib list of complements inspired me to take a taste of Atlanta back to my kitchen. At home, made with bay scallops and bacon, and with cubes of celery root instead of the swath of creamy puree that The Optimist placed on the plate, the dish becomes incredibly versatile. It’s a deluxe brunch hash, a swanky light lunch when served with a lemony arugula salad, or a single-girl supper for those nights you wanna treat yo’self. Seek out Marcona almonds for the recipe and don’t be tempted to sub in the regular kind—the salty, oily crunch of Marconas contribute so much flavor to the final product. Place the bacon in a large skillet or sauté pan over medium heat. (Choose a pan that it’s possible to cover with a lid.) Cook the bacon for about 10 minutes, stirring frequently, until the pieces are crisp and have rendered their fat. Remove the crisp bacon pieces and reserve on a paper towel-lined plate. Add the celery root cubes to the skillet and stir to coat evenly in the bacon fat. Cover and cook for about 10-15 minutes, stirring frequently, until the celery root is tender and crispy at the edges. 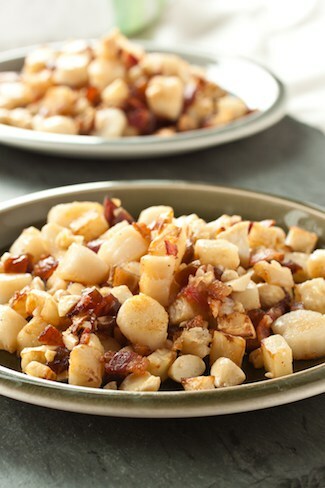 While the celery root cooks, place the scallops on a large kitchen towel (not terry-cloth) or paper towel and pat dry. Remove the cooked celery root from the pan and reserve in a serving bowl. Raise the burner heat to high and add the scallops to the pan in a single layer. Cook for no more than 2 minutes per side, just until the scallops get a bit seared and golden brown. 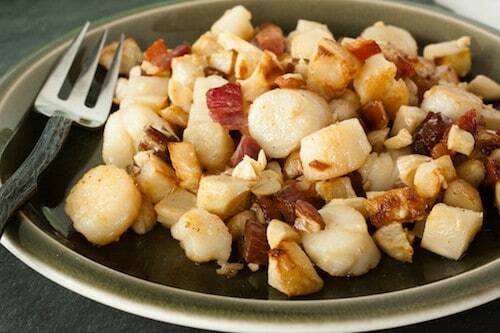 Toss the scallops with the celery root and add the bacon, dates, and almonds. Season with salt and pepper to taste and serve immediately.